CONGRATULATIONS 2011 GRADUATES! For the next few weeks, Scholarship News will be dedicated to recognizing recent ThanksUSA graduates. This week, we congratulate Kelly McCorkle, daughter of CW4 (RET) Earl and Cheryl McCorkle. Kelly received a ThanksUSA scholarship during each of her four years of undergraduate studies totaling $10,000! 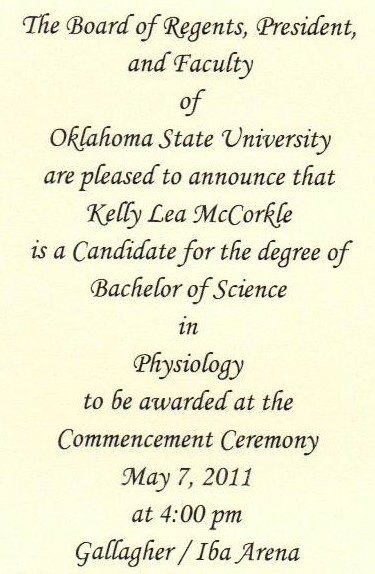 On May 7, Kelly graduated from Oklahoma State University with her Bachelor of Science degree in Physiology. She plans to continue her education by enrolling in Physician’s Assistant School. Congratulations Kelly! We wish to remind all students that ThanksUSA is accepting scholarship applications for the 2011/2012 academic year through Monday, May 16. All military spouses and dependent children pursuing undergraduate studies are encouraged to apply. Military spouses are also eligible to apply for scholarships if they are pursuing non-degree licensure or certification. Kaplan University is proud to offer a full undergraduate scholarship through ThanksUSA for an eligible military spouse. In addition, Educational Support Scholarships, which provide for reduced tuition of up to 50 percent, are also available to eligible military spouses. Please visit ThanksUSA for application details. You can support students like Kelly by making a $10 donation today…simply text THANKSUSA to 85944 to make your $10 donation.